Place the cubed squash in a medium saucepan with the water and a pinch of salt and bring to a boil over high heat. Lower the heat to medium, cover, and steam until the squash is tender, about 6 minutes. Remove the squash with a slotted spoon and then add the green beans to the pan. Repeat the process, topping up the water if needed. 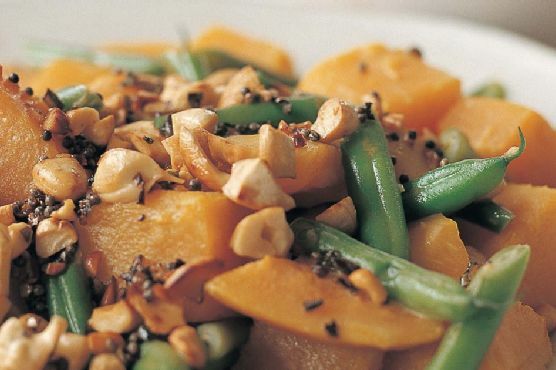 Return the squash to the pan with the green beans and any remaining cooking liquid. Add the coconut milk and a little more salt if necessary. Bring to a boil and immediately turn the heat down to low. Simmer the curry, uncovered, until slightly thickened, about 8 minutesdont allow the mixture to come to a rolling boil or it will curdle. Do not stir because the squash may start disintegrating; shake the pan if you need to mix the ingredients. Transfer the curry to a serving dish.